Why limit yourself to small floatplanes. The updated G-111 Grumman Albatross can hold up to 28 passengers and three crew. We received several emails from readers – and pilots – commenting on and asking questions about our earlier article recommending a floatplane as a bug-out vehicle. It was not and is not our intention to fully explain all issues of owning and flying a plane to non-pilots as part of what was a 1600 word article – there’s just way too much complexity. Our intention was/is to point out the key issues and to encourage you to further research an option you may not have otherwise considered. We did feel it a bit unfair to be accused of failing to point out several downsides to relying on a plane, when they were indeed specifically mentioned in the article (such as, for example, the possible loss of GPS as a navaid). Hey guys – read the articles before you criticize them for not including things that actually are in them! Anyway, the article drew a lot of interest, so we are pleased to provide some more introduction to this topic. Here are some more comments in a further 2800 words of content. If you haven’t already, perhaps you should read our original article first, then come back here for some additional considerations. The big concern we all have in a bug-out situation is getting stuck in an increasingly insecure and dangerous mess of traffic along with everyone else leaving our urban area, fleeing whatever Level 2 or 3 disaster it is that is causing the exodus. In this article, we look carefully at the risk of getting stuck in a mass exodus of traffic, and actually conclude that such a risk is minor rather than substantial. But just because a risk is minor does not mean it is not still present. From the risk-averse perspective of continuing to be concerned about being stuck in bumper to bumper traffic, the ability to fly over the top of the stalled traffic, cruising at 150 mph in the uncongested sky while people below are inching along in stop and go, bumper to bumper traffic sure sounds wonderful, in theory. But there are some challenges that will affect some people more than others. The first is getting to your plane in the area you live, and being able to fly it out of the region. If you have a regular plane, this assumes that the airport the plane is housed at is reasonably accessible to you, and it further assumes there is a cooperative air traffic control system still in place, or, failing that, at least a clear taxiway and runway that you can get to in your plane to take off. More assumptions – some survivalist blogs have posted comments from people saying that if something goes seriously wrong, they’ll simply head to the airport and steal the first plane they can get their hands on. What happens if that is your plane? You are assuming that your plane will be waiting for you, and in flyable condition. What say the event that forces your evacuation has impacted on the airport, and the planes there? This of course is part of the reason we like float planes. They can be discreetly moored or garaged on the shore of pretty much any lake with enough straight-line distance to take-off; or on the side of the ocean, or sometimes even on a stretch of river or reservoir. The people who think of stealing a plane at an airport are less likely to know about your plane on a lake (assuming it is discreetly stored) and also fewer people know how to fly float planes than know how to fly regular planes. You don’t need to be able to fly right up to your retreat’s front door – although for sure that would be ideal. The bug-out plane flight can be limited to merely getting you out of the major urban area you need to leave, and over the top of any other urban zones or other obstacles on the way. As long as you have some pre-positioned vehicles, or an ultra-reliable person who can and will for sure be there to meet you, you can fly to pretty much anywhere that achieves the objectives in the previous paragraph (another reason for needing good long-distance radio comms). We are assuming that your retreat will be at least 100 miles from major population centers and some distance from smaller towns and definitely removed from major roads and routes. Make sure that wherever you do land is located so there are no remaining potential obstacles in your path to your ultimate destination. Obstacles could be other major population centers, or the need to cross over freeways or other routes that will be quickly filled with refugees from cities (not just the city you are leaving behind, maybe from other cities too – possibly even traveling in the opposite direction). If you are making one single trip and are happy to then discard the plane, particularly in response to a Level 3 event, you can probably fly to anywhere that has suitable area to land, no matter whether it be a restricted area such as a reservoir or something or not. If you’re just going to be landing, getting out of the plane, transferring immediately to waiting vehicles, then driving away, by the time any local officials have responded to your flight, you’ll be already gone. But if you don’t want to completely ‘burn your bridges’ and if you also want to be able to do some practice runs, you’ll need to be a bit more sensitive to where you legally can and can’t land your plane. Wherever your plane is, it is reasonable to anticipate a moderately worst case scenario that all the roads will be jammed, in all directions. Unless you live extremely close to your plane, getting to your plane could be difficult. Our recommendation, for what is probably a short journey, is to consider a bicycle, a powered bicycle, or a motorbike. Being as how the airplane is limiting the amount of stuff you can take with you when you fly out of your urban area, the inability to load up a car full of gear is not so relevant. On the other hand, your journey to where your plane is located may take you further in to the center of the urban area, and possibly through areas with rioting and looting. You’re vulnerable as one or two people on an open bike, whereas at least in a regular vehicle you have some more protection against casual violence by bystanders. Again, a plus for floatplanes is if you live in an area with several different lakes to choose from. 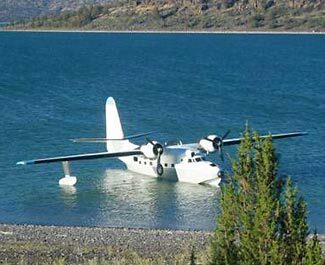 This depends a bit on the type of float plane you would fly, the altitude the body of water is at, the temperature, wind and water conditions and how fully loaded the plane would be. It also depends on what is directly in front of you after taking off. If there are any nearby vertical obstructions (buildings, hills, whatever) you not only need to be able to take-off but also to gain enough altitude to fly over the top of these obstructions, or to have enough room to do a gentle turn away from them towards a clearer direction to gain altitude. Best case scenario, you should hope for about a half mile of straight water. Some planes can take off in less space, others may require more. The same issues also apply to the amount of straight-line water you’ll need to land, although landing generally requires less distance than taking off. Note that higher temperatures and elevations require longer distances, as of course do more fully laden planes. Tail winds are very bad, head winds are good, and water conditions are best with a slight ripple, but not large waves and also not glassy smooth conditions. In a river, it is great to take off down-river, and slightly better to land up-river. The floats probably weigh more than a conventional undercarriage for a plane, so be sure, when checking out plane options, that you’re understanding the specifications for a float-fitted plane rather than a conventional version of the same model plane. Lower load limits mean not just fewer passengers and less stuff, but perhaps also less fuel, which means less range. And while we don’t have exact figures at hand, we’ll guess that floats are slightly less aerodynamic and may cause the plane to burn fuel slightly faster during the cruise portion of flight, due to greater wind resistance. With each pound of load capacity being greatly needed, either for people, things, or fuel, this might also give you and anyone else flying with you the inducement you need to lose a little weight. In a light plane, each pound you lose allows you to add enough extra fuel to extend the plane’s range by 5 – 10 miles. Many Level 2/3 scenarios might include the disabling of some or all of the common navigational aids that pilots rely upon to work out where they are and where they are going, and so you should plan on being able to get where you need to go using nothing more than a compass, paper map, and timer. Needless to say, you can’t stop and ask for directions when flying a plane, and if you’re planning on using nearly all your fuel to get where you need to go, you can’t afford to waste any fuel by unnecessary flying around or low-altitude flying, trying to recognize land-marks. You’ll of course need to practice flying the route using only compass, map and timer, several times. With the wonderful nature of modern navaids (VOR, ADF, and especially moving map type GPS units) these traditional navigational skills have been largely overlooked by many of us. It also goes without saying that almost certainly, the place you’ll choose to land at your destination doesn’t have modern airport landing aids – neither ILS or even VASI type aids. This also leads to the next point. Essentially you’ll need to be flying in some type of modified VFR type scenario, primarily due to the possible need to navigate visually. You could do this by going above the clouds, flying on a certain heading for a certain time, then popping down below the clouds for a quick look-see and adjustment from time to time, of course. Float planes are more weather sensitive, when taking off and landing, than regular planes on regular runways. Your biggest concern is probably the weather and light conditions at your destination, because even though you might have back-up landing locations, you almost certainly don’t have any personal support resources (ie vehicles) at these backup locations, and in a SHTF type situation, you might have no way of getting any weather reports relating to your destination before heading to it. The likely need for visual navigation, and the challenges of landing on a lake, probably mean that most of your traveling, and particularly the final part of it, will need to be done in the daytime. This might force you to spend some number of additional uncomfortable and dangerous hours staying in the urban concentration before you can leave. A possibility is to consider making more than one trip to evacuate your group members. If you have a four seater plane, this means you can take yourself and three others in one flight – four altogether. If you could return, you could then load another three people for a second flight, making a total of seven. With a six seater, this would allow for 11 people in two flights. In such a case, you need to consider where you choose as your destination. It doesn’t need to be as close as possible to your retreat – although the closer to your ultimate destination, the better. It just needs to be safely far away (in terms of both distance and leadtime) from the exodus of other people leaving the city. If you choose a point 100 air miles away, that might be 120 road miles, and might take you just under an hour from climbing onboard the plane to getting off it at the other end (cruising at 120 mph, slower on the climb, and time to taxi in and out). Flying back to get a second load of passengers would take you maybe another two hours for the roundtrip, perhaps a little less (and assuming no need to refuel in the middle). Add perhaps 30 minutes to get to your plane from your residence, and so in total, your group would be all able to leave the far away location 3 1/2 hours after you started your evacuation. But that same 3 1/2 hours also gives plenty of time for the first elements of any exodus of people in regular cars to be at the same place. A 100 mile flight is fine if you make it only once, but if you need to go back, it is better to fly further, or to a point that will not require you to then travel overland via a major arterial evacuation route. A location 150 miles away (say 180 road miles) would take you about 4 3/4 hours or so from when you leave your house to when the plane returns with the second load. There would be many fewer vehicles at that same distance – some will have turned off, some will have run out of gas, and only the very early ‘advance guard’ of people will be driving by at that point, and perhaps due to their ‘success’ they’ll not be such potential threats. A 200 mile distance (240 road miles) is probably getting close to the safe range of your plane on a single tank of fuel ( ie 600 flying miles, plus three take-offs and climbs to cruising altitude). This would be a 6 hour total maneuver. Of course, if two trips are good, are three trips better? If four seats are good and six seats better, how about eight, ten, twelve or more seats? It is hard to decide where to draw the line, which brings us to one of the key constraints. If you were making multiple trips to collect members of your group, this opens up another possibility. There’s no reason why you have to return to the same location to load more people each time. Maybe you go to a different place to collect other people, and maybe you even become a glorified bus, making multiple stops for different people in locations that work for each person. It also means, assuming you have radio communications, that you can vary the pickup location based on where the people you are collecting can get to, based on traffic and weather conditions, etc. Keep in mind that sooner or later, if you’re doing multiple runs, you’ll probably need to refuel your plane. This would be preferably done at the distant location, which is more likely to be more secure. At the close-in location to the city, you have too many uncontrolled variables that might impact on your security and safety. You’ll want to be able to swoop in, land, quickly load your passengers, and then leave again before any local people have formed into a group and come to commandeer your plane or to say ‘You can’t do that here’ or whatever other form of interference they may choose to mount. It should go without saying that flying is far from the lowest cost way of traveling to your retreat. You need to buy a plane, and then you have all the ongoing costs of keeping it maintained, insured, and hangared. You also need vehicles to get you to your plane – vehicles that will of course then be abandoned, and other vehicles to get you from your plane to your retreat – vehicles that are in addition to the vehicles you own and normally drive in the city. Depending on the size of your family group, your plane, and the feasibility of doing two (or more) trips to bring more people with you, it might be possible to share the costs of a plane with other people, making it more affordable. This might also remove you from the need to get a pilot’s license and to get type rated for a float plane. If someone else in the group can do the flying, so much the better for you. This is something where the Code Green Community may be able to help. Contact us if this is something you’d like to participate in. Please also visit our article on a Flying Car for a compromise vehicle that can be both flown and driven.